We have three rooms available, all are bright and spacious. One is a double room with a dressing room and an en-suite bathroom. The second is a double/twin/family room with a washbasin in the room, a private bathroom adjoining, and dressing gowns provided. The third is a twin room with an en-suite shower and toilet. Our newest room is a twin en-suite with shower. The two beds can be put together to make a super-king sized bed (on request). The family room has a double and a single bed, with space for an additional single bed and/or a travel cot if required. Please let us known in advance, so we can arrange the room. It has a private bathroom, with bath and shower. 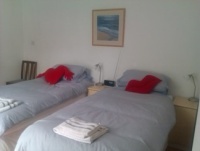 The double room has its own dressing room and an en-suite bathroom, with bath and shower.